The Chocolate Muffin Tree: Beaded Snowflakes.....and Happy Winter Solstice! Happy Winter Solstice! So appropriate to be making snowflakes and other wintery things! 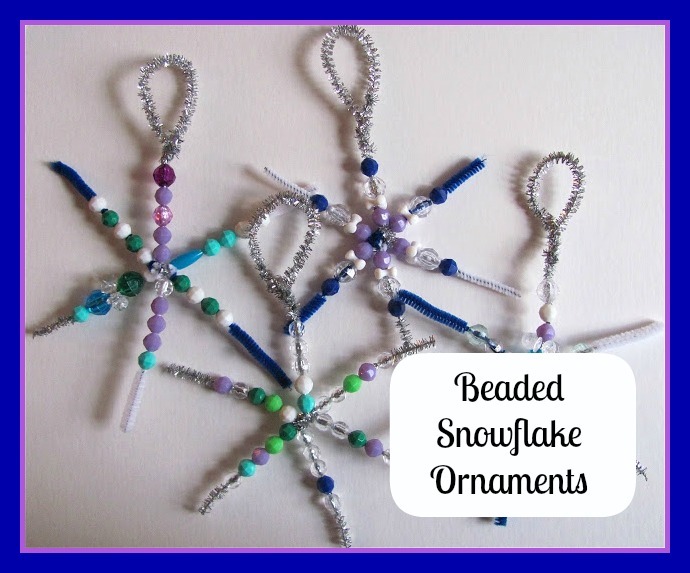 We made some Beautiful Snowflakes using some Chenille stems and some beads! They turned out rather Lovely! This is a nice simple activity that could make a great holiday gift of an ornament or just something to occupy your kids while you are so busy. I know I have been super busy! 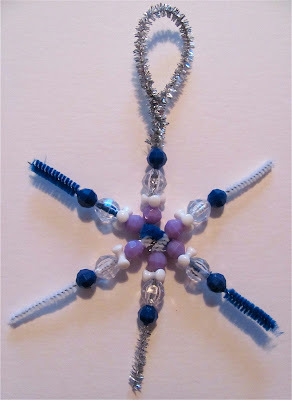 I chose chenille stems in icy colors like Blue , Silver , and White to look more like wintery snowflakes. For the beads, I chose icy colors (cool colors like blue, green, and purple) and crystal clear beads to add to the wintery effect! I cut the chenille stems in half and twisted three of them together to create a star or asterisk shape. You could use all the same color or mix like I did here. The all you need to do is slide the beads on the chenille stems. You could put them on randomly or in a pattern. Here is one with more of a pattern! 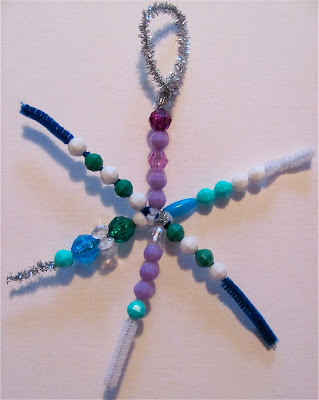 Then take another half of a chenille stem and twist on a loop to hang the snowflake! I just love these! Cassie has been working on a few each day. We'll have a collection by the end of the week! Thanks for the idea! they are simple and perfect for the little hands! We got a pack of winter color pipe cleaners from Target dollar aisle. I adore this, ornament and beads, proper colour and all, how wonderful are you and your daughter, I'm in awe!!!! Wow, wow, wow! These are so beautiful and the colours are just so soothing for the eyes! The moment your page opened, it was as though something cool and tranquil welcomed my eyes. They are very pretty - I pinned them as something we might do in January. Thanks for sharing! So pretty. I love snowflakes and these are pretty enough to leave up all winter long :) Thanks for sharing.